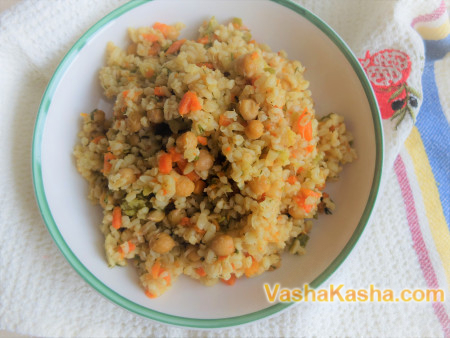 Delicious bulgur pilaf with chickpeas can be cooked in a slow cooker and absolutely no meat. 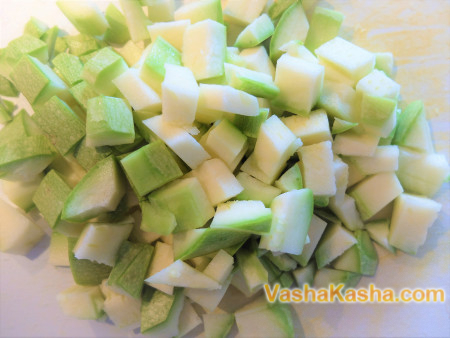 If you are a vegetarian, or keep a post, or maybe you want to try something new - then this recipe is for you! Bulgur cereal is made from durum wheat. Wheat grains are treated with thermal water, then they are dried in the sun and purified from bran. 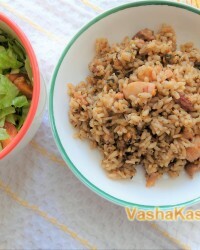 Bulgur is popular in Asia and on the African continent. 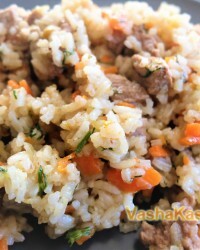 The taste of Bulgur is very delicate and a bit like hazelnuts. 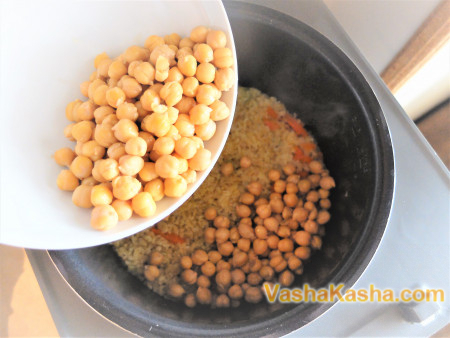 Bulgur with chickpea beans is a great combination! Vegetable protein, which is contained in the beans is easily digestible and nutritious, and most importantly replaces animal protein, which is very important for vegetarians. 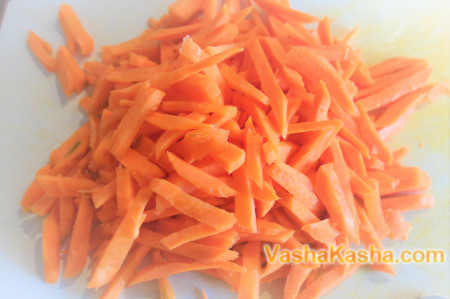 Cut carrots into small pieces. 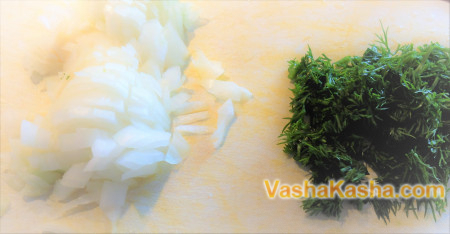 Onions and parsley - finely chop. 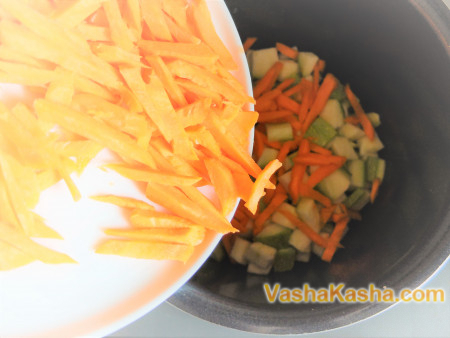 Pour carrots, zucchini and onions into the crock-pot, add some water (you can add vegetable oil). We put the mode "Quenching" on 20 minutes. 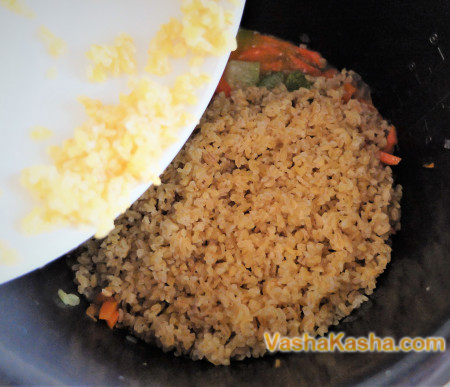 While stewing vegetables, we wash bulgur in cold water. 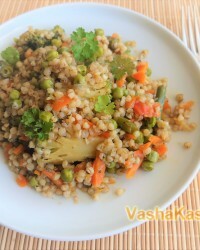 When the mode of "Quenching" is over, it is time to put bulgur in a slow cooker on top of vegetables, do not mix. Fill hot water on 1 cm above cereal, set the mode "Pilaf". For 10 minutes before the end of the "Pilaf" mode, we pour canned chickpeas into a slow cooker, add salt, add seasoning for pilaf, greens and garlic, and mix. If you do not have canned chickpeas, then it does not matter! 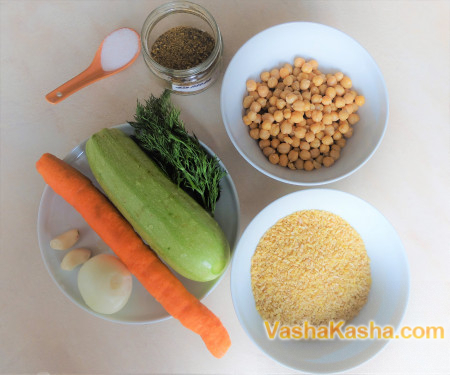 We take dry chickpeas, fill it with cold water and put them in a refrigerator overnight, chickpeas will absorb water and become much softer. But we put it in a slow cooker in this case, along with vegetables - STEP 4. After the end of the "Pilaf" mode, remove the garlic cloves, mix and leave for another 10 minutes under the lid of the multicooker. 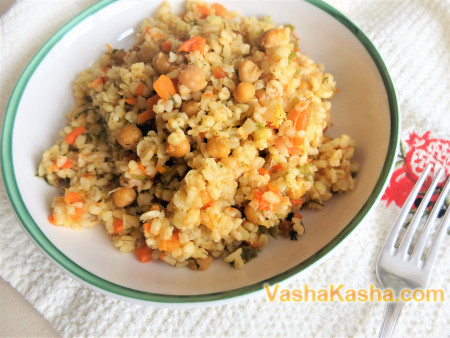 After the time has elapsed, we can set the table and feast on bulgur pilaf with chickpeas! Enjoy your meal! !